Survivorship bias is the logical error of concentrating on the people or things that "survived" some process and inadvertently overlooking those that did not because of their lack of visibility. This can lead to false conclusions in several different ways. In this article I am going to discuss two areas which some investors believe are examples of survivorship bias. I believe one of them is an example, while the other is not. Basically the danger of survivorship bias is that investors make up their mind on what works or doesn’t, using an isolated example, without even bothering to consider any factual evidence. This is dangerous because those investors would then search only for ideas supporting their conclusions, and reject those that do not do so. Therefore, investors might end up missing out on important information, because they only focused on the facts that supported their original ideas in the first place. For example, I have been reading statements from many investors about how profitable it is to be buying stocks after dividend cuts. Common examples provided are General Electric and Wells Fargo, which would have returned several hundred percent since cutting dividends in 2009. Furthermore, dividends have increased since those cuts, thus resulting in high yields on cost for investors that were smart enough to buy in 2009 (this writer was not that smart to buy at the bottom, though I have my doubts that those who claim to have bought at the bottom are telling the truth (the sole exception that is verified is Warren Buffett and Charlie Munger)). The problem with this statement is that it ignores all those companies that cut dividends and either went out of business, or didn’t result in gains for investors. After researching results from studies performed by Ned Davis research, I think that investing in dividend cutters and eliminators can result in poor performance over time. A $100 investment in dividend cutters and eliminators on the S&P 500 in 1972 would have been worth only $264 by 2013. The same investment in dividend growth stocks would have been worth almost $6,000. Unless you are particularly skilled, chances are that after you make many investments with this strategy of buying after a dividend cut, your overall results will not be as exciting, as the cherry picked examples of Wells Fargo or General Electric. You might get lucky and hit a homerun once, but the longer you keep investing, the higher the chances that your results will be affected by the lack of edge in buying dividend cutters and eliminators. For example, those investors who picked Bank of America (BAC), Citigroup (C), or Washington Mutual after they cut dividends, didn’t do as well. A second example involves buying dividend growth stocks like dividend champions for example. Many investors erroneously claim that investing in dividend champions like Coca-Cola (KO) or Pepsico (PEP) is an example of survivorship bias. I disagree with this statement. It would be an example of survivorship bias if investors merely put money in Coca-Cola because it raised dividends for 53 years in a row, and never did any additional research to justify their investment. However, I have not met a single dividend growth investor, who mindlessly buys stocks merely because they have raised dividends for 50 years in a row (those who purchase dividend ETFs are the sole exception). Most dividend investors I have interacted with carefully evaluate quantitative and qualitative data behind companies they invest it. It is true that an important portion of dividend growth investor screens is consecutive years of dividend increases, but in reality these are just one of the many hurdles investors use in order to gauge whether future dividend growth is likely. The truth is that companies like Coca-Cola (KO) or Johnson & Johnson (JNJ) are used as examples for mere illustration of what the wonders of dividend growth investing can do for you as an investor. Either way, a company doesn't manage to increase dividends for 25 years in a row by "accident". I personally was attracted to the world of dividend growth investing in 2007. It made sense to me that a quality company that is able to grow earnings and dividends for at least a quarter of a century will likely be a good investment, especially if purchased at a good price. I reviewed the performance of the dividend aristocrat index between 1989 and 2007 on my site early on. This looked like a very convincing picture to me. It is even better that the dividend aristocrats index managed to keep doing better than the S&P 500 index since I uncovered it. 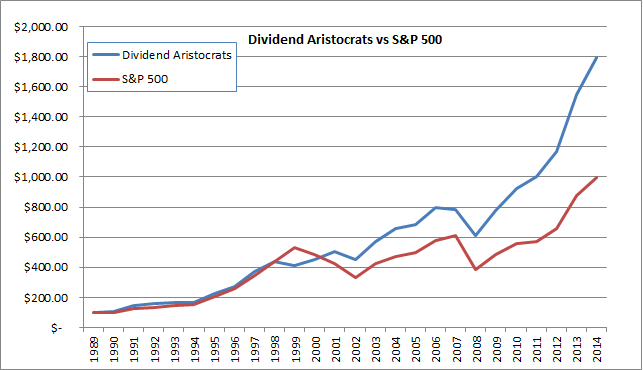 The dividend aristocrats index is up almost 129% between the end of 2007 to the end of 2014. The S&P 500 was up roughly 63% during the same time period. While I cannot tell you if this will continue in the future, I am pretty confident that over a long period of time, a group of quality companies that grow earnings will deliver outstanding performance. It is common sense after all. Going back to my disagreement a paragraph above, a tremendous amount of research goes into deciding whether business fundamentals can support more years of consecutive dividend increases or not. Therefore I do not think most investors purchasing Coca-Cola because they are impressed with the dividend growth history are suffering from survivorship bias. Plus, these investors are not just buying Coca-Cola (KO) - they are likely creating a diversified portfolio of dividend growth stocks with long histories of dividend growth. You can create such a portfolio quite easily, it can be well diversified by sector, it could be equally weighted, and the annual cost would be much lower than the lowest cost index fund out there. The returns will be generated from dividends and capital gains, which increases the ability to sleep well at night. I would never invest in something where I am relying only on increases in the share price. This is called speculation. Since this article is already getting to be too long, I will take a pause, and post the second part tomorrow. Please stay tuned.